White painted steel frame with black plastic slip resistant treads. Rubber handle for extra comfort. 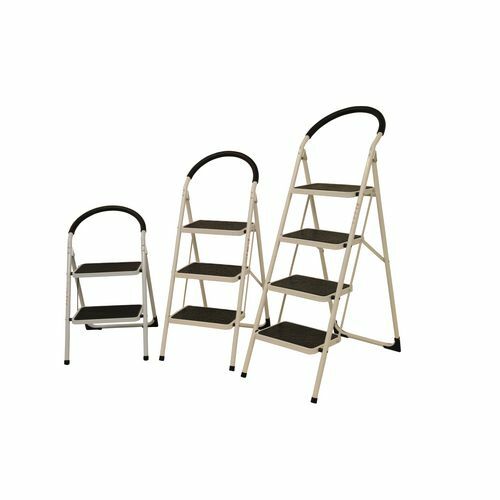 Folding steps help to safely access areas that may be hard to reach from the ground, providing a sturdy place to stand. These folding steps from Slingsby are an ideal solution for working at areas that are hard to reach from ground level due to their height. The black plastic slip resistant treads offer great underfoot security and the rubber handle provides extra comfort. Safety and quality is important to us so they comply with EN14183 standards and have a maximum load capacity of 150kg, making them suitable for use by most people with or without tools and equipment. Finished with a white painted steel frame, these steps come in a choice of 2, 3 or 4 treads. 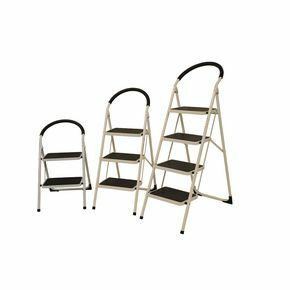 Our folding steps are a great solution to help you safely work at height, offering a sturdy piece of equipment to support the user. They come with a 12 month guarantee and FREE UK Delivery.